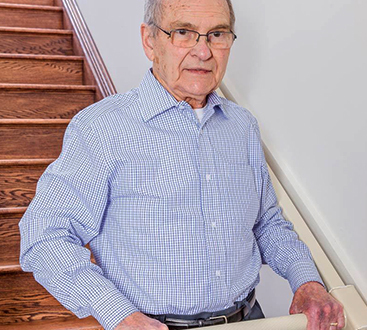 Stay at home independence for Canadians who have difficulty using their stairs. Constructed in the Greater Toronto Area, our StairSteady System is a high-quality handrail system that folds out of the way when not in use. 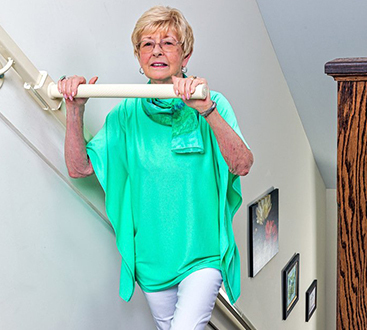 It is like receiving help from a steadying hand on the stairs, allowing you or a loved one to move between floors and helping to prevent falls. State-of-the-art stamping techniques are used to manufacture StairSteady Systems, which ensure optimum strength. Also, zinc die casting makes sure that parts are consistent, reliable, and able to support up to 225 pounds. A StairSteady System can be installed in your home for a fraction of the cost of regular systems, and can be installed within 2 days of placing your order with an authorized contractor. A StairSteady System blends in with the décor of any home, will not obstruct your stairs, and no major renovations are required. ©2018 Hillz Tech Ltd - Do not copy. All rights reserved.